A soft touch flannel sheet set is just what you need to stay warm and cozy on those cool fall evenings and cold winter nights. Made of an incredibly soft and comfortable, yet highly durable 100% cotton flannel fabric, these superior quality flannel sheets are offered in a wide assortment of colors, and will look great in any bedroom—providing unrivaled flannel comfort for many years to come! Available in a full range of sizes to fit virtually any bed, including twin, XL twin, full, queen flannel and king flannel bedding sizes, these fantastic flannel sheets are currently offered in a vast array of vivid color options, making it easy to find the ideal flannel sheet set for your space. Choose from blush, brown, burgundy, café, ivory, and sage green to match your current décor—or give your bedroom an incredible new look in just minutes! Each of these comfy flannel bed sheet sets includes one top flat flannel sheet, one bottom fitted sheet, and two coordinating flannel pillowcases (the twin flannel sheet set comes with just one pillowcase). For extra long twin beds, a soft touch flannel sheet set is also perfect for any college student living in a dorm room. Great for gifts as well! With our unbeatable everyday online prices on sheets, comforters, blankets, bed sets, accessories, décor, and so much more here at Laurens Linens, you can get a flannel sheet set for every bed in your home! Order online now to take advantage of our best pricing and selection of the year! Online orders can be placed at anytime right here from our completely secure site! For more information about these flannel sheet sets or other flannel bedding products available in our current inventory, or to place an order by phone, just give us a call toll-free now at 877-233-2284 and a friendly Laurens Linens representative will be happy to assist you! 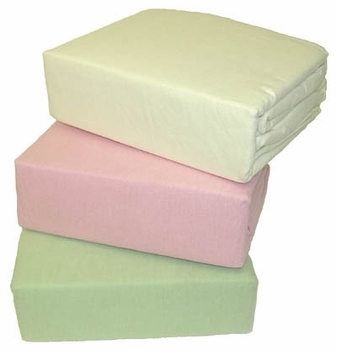 All soft touch 100% cotton flannel sheets are machine washable and dryable to extra easy care and maintenance!